Desert Festival will Celebrate 23 Feb to 25 Feb 2013 in Jaisalmer in Rajasthan India. 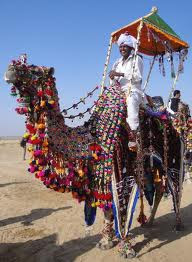 The desert festival in Jaisalmer was started with an aim to attract foreign tourists, who always look forward to explore more and more facets of Rajasthan. 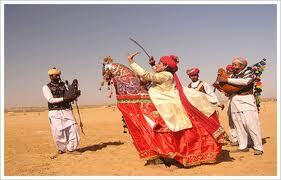 This no-nonsense festival only showcases Rajasthani folk songs and dance to promote Jaisalmer culture and traditions. The festival culminates on 'Purnima' (full moon day). 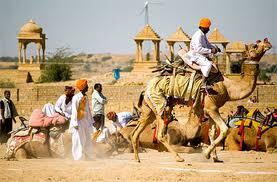 The Rajasthan tourism organizes the Jaisalmer Desert fair/festival. Tourist help cell are setup to solve the problems faced by foreign tourists. The local administration monitors the arrangements and Medical vans equipped with all the essential medical facilities, are kept on call in case of emergency. The major attraction of Jaisalmer Desert Festival is to showcase the culture of the region and thus glorifying of the desert land. 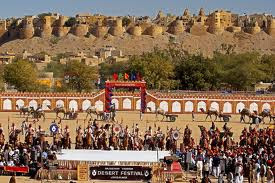 The annual desert festival is held on the backdrop of the Jaisalmer fort. The sand of Jaisalmer comes alive with the dazzling colors, vibrant music and laughter of the Desert Festival between the pinks of winters. The people dressed in brilliantly hued costumes, dance and sing the poignant ballads of valor, romance and tragedy. The fair has snake charmers, puppeteers, acrobats, folk artists and various competitions are also held here. The festival closes with an enchanting sound and light show in the moonlit night amid sand dunes with a promise to come back again next year. The festival has a history of its own. As far the legend is concerned, it is believed that Lord Krishna who was the head of the Yadav clan, had told Arjuna that some descendent of the clan will built a kingdom. The kingdom will be situated on top of the Trikuta Hill. His prediction came true around 1156 A.D. Rawal Jaiswal who belonged to Yadav clan, abandoned the fort at Lodurva and formed the present city of Jaisalmer. So the city of Jaisalmer was built atop Trikuta Hill. Rawal Jaiswal belonged to Bahti Rajputs, who was the feudal chief. They used to live in caravans, which were stuffed with silk and spices. The desert festival is one of the most colorful events where you can see cultural events, including camel races and turban tying competitions. One of the unique competitions which are held in this event is the moustache competition. The people with best moustache are given an award. Most of the events which are performed are mostly exotic in nature. There are folk performances by traditional musicians from different regions. Folk dance competition is also held, which lifts up the spirit of the festival. If you are in look out of some traditional handicrafts, then you can visit the craft bazaar. The bazaar is set up at this time, where you can get some of the best handicrafts items. 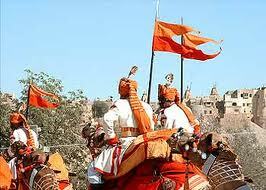 The major attraction of this festival is the famous Gair and Fire dancers. This performance is a major tourist attraction from all over the world. The rhythm of Ghumar, Kalbalia, Gair and Fire dancers dancing on the beats of folk music are the major attraction of the desert festival celebrations. The dancers in vibrant and brightly coloured costumes dance like flying butterflies. 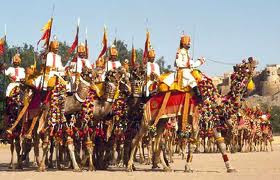 Jaisalmer Desert Festival is the best occasion when the rich and colorful culture of the desert region is highlighted. Villagers are heard singing the ballads of tragedy, valor, and romance of the local heroes and they dances to the folk tunes. Snake charmers, puppeteers, acrobats and Camel rides are quite popular here. 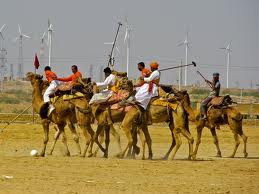 Camel polo and camel dance is the uniquefeature of the fair. It is worth noting that turbans and mustaches are considered symbols of honor in the region. Many contests further add to the fun of the occasion. There is also a Mr. Desert contest that further enhances the fun of the occasion. The music pass through the snaking lanes of the town to the sand dunes and the rivers of deserted villages casts a strong spell on everyone. The fair begins with the sunrise; it reaches its pinnacle. It is mainly a festival of the performing arts even then several other events that peek into the desert culture are held. The long moustaches carefully coiled are a common sight there. 'The moustache competition' is the most popular competition among foreigners. Men dressed in traditional and colourful apparel with long moustachesparticipate in this contest. The tug-of-war is the activity in which team of foreigners selected compete with that of locals. The turban tying competition showcases the talent of the locals tying the turbans that are several feet long. The bright and colorful turbans are very attractive. Foreigners also participate in the event and show their skill in tying turban. 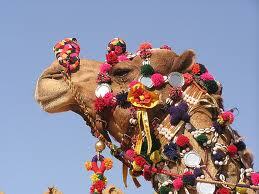 Camel rides on the gorgeous Sam sand dunes of Jaisalmer are a vital part of the festival. 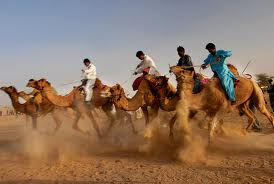 Camel races are organized to entertain visitors. The nights are full of amusement; the talented local artists sing melodious songs, dances to the local tunes. The audience is mesmerized by the activities. 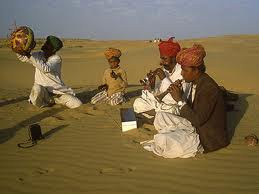 The desert landscape looks more beautiful in the sounds and lights; thus making it a memorable experience for everyone.